SCAM INVOICE WARNING A number of people have received invoice reminders that purport to come from/on behalf of Sturge Conservation Studio. I am sorry but these are scam emails and should be treated with great caution/deleted. If you genuinely think you have had dealings with me please check with me first. Welcome to the Sturge Conservation Studio. The site for the conservation and restoration of historic leather, including leather furniture, upholstery, gilt leather, Spanish leather, leather screens and wall hangings, historic clothing, harness, coaches, cars, sedan chairs, saddles, luggage, boots and shoes etc. More modern items include Eames chairs, Barcelona chairs, and swan and egg chairs by Arne Jacobsen. There is a further site www.sturgeconservation.co.uk which gives information on other services offered. These include general antiquities, mosaics, archaeological wall paintings, replicas and training. Left. 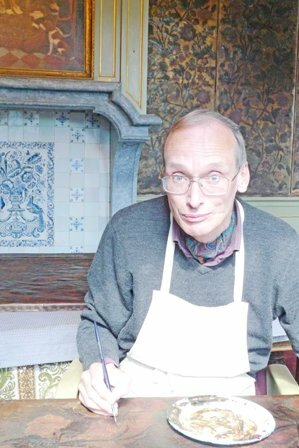 Theo Sturge working on gilt leather wall coverings in Stadhuis van Dokkum, (Dokkum Town Hall) Gemeente Dongeradeel, the Netherlands. Theo spent 5 weeks conserving the leather on site in 2011. The leather dates from around 1750. Leather can often be restored or conserved when at first glance it appears to be beyond help. Splits can be repaired, holes can be filled, and weak areas can be supported. In addition, where colour has been lost it can be reinstated. Care is always taken to try and meet the needs of the owner, and take the level of work to that required. It is rarely possible to bring an object to an "as new" state, but it is usually possible to make it look loved and cared for. Retaining the original leather, but enhancing its appearance, leads to an object which retains its historic appearance and integrity. Theo Sturge is an Accredited Member of the Institute of Conservation, a Fellow of the International Institute for Conservation. He provides leather conservation advice to the National Trust. The Sturge Conservation Studio offers a service to both the public and private sector in both the UK and abroad. Clients include the National Trust, The National Trust for Scotland, members of the Historic Houses Association such as Alnwick Castle, RIBA, major museums including Birmingham Museums and Art Gallery, the National Horseracing Museum, York Castle Museum, and the Museum of Leathercraft, and private clients in the UK, the Netherlands and the USA. Theo Sturge has over 30 years experience in conservation and restoration. Prior to setting up the Sturge Conservation Studio in 2000 he held posts in major museum services in the UK followed by work in the private sector. He has specialised in leather conservation and restoration for 16 years and has published widely. Sturge Conservation Studio, 6 Woodland Avenue, Northampton, NN3 2BY, UK. Please enter your name, email address and message below and then click on the SEND MESSAGE button. If you prefer, send an email to webenquiry@leatherconservation.co.uk Any information you provide will only be used to respond to your enquiry. No information will be passed on to anyone else without your permission.